Twelve day’s hike through dense jungle from the nearest city, few people make the journey to the Temple unless they have a real need for it. Dedicated to the Goddess of Poison and Plague, it’s not somewhere to visit without good reason. Contents: A multiple level map consisting of a 3 storey fortified temple, spread across 3 30×30 battlemaps, each depicting a different floor of the temple. 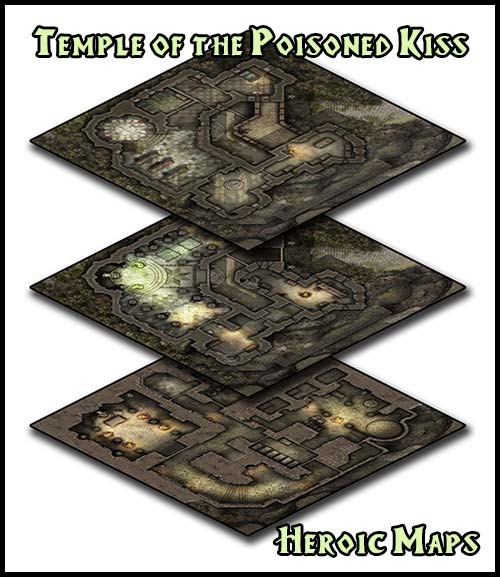 Ground Floor – includes a fortified entrance, large temple to the Goddess, a small courtyard, and an area where visitors can buy poisons and antidotes. 1st Floor – Rooms for the Priestess and her followers, a meeting chamber, library, and guard rooms. Dungeon – Prison cells, chambers filled with disease and plague, poison laboratories, shelves lined with potions, an inner sanctum temple.